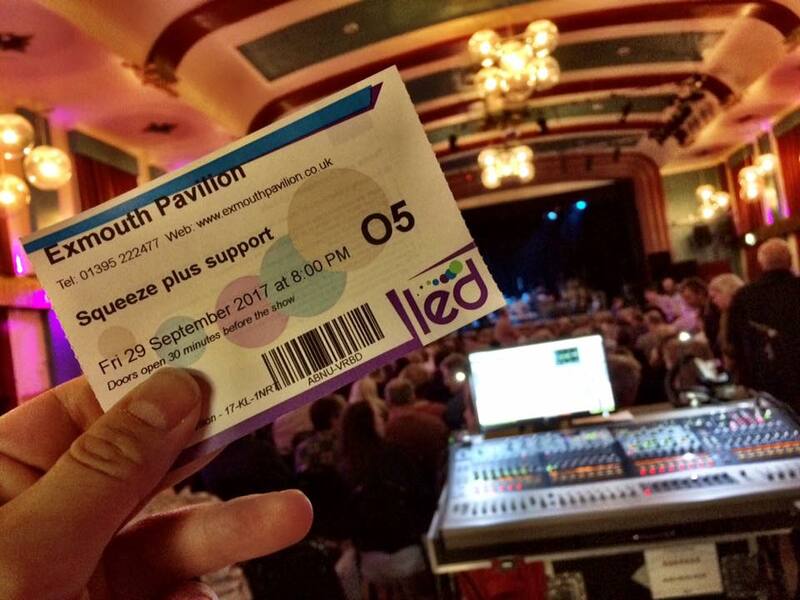 15 Responses to "Squeeze – 29 September 2017 – live at the Pavilions, Exmouth"
It’s only the second warm-up date of the Squeeze Join the Dots concert tour to promote their new album ‘The Knowledge’ and the new band’s second gig together. How did they do? Is it worth going to see them on the tour? How do they sound? What’s the new material like? I love Squeeze, always have, always will. I’m also incredibly sensitive to their legacy and to how the crowd react to them. If it’s not going to be great then I’d rather they didn’t play at all. They’re both great solo as it is – but if they come together in the right way they can be magnificent. Will it be the right way tonight? As I parked on Exmouth seafront and walked to the venue I could see Chris Difford’s car parked outside the stage door, already reversed to make a quick getaway. So what was the show like? Well. it’s Squeeze, Jim, but not as we know them. Squeeze are now a six-piece with our dynamic duo Difford and Tilbrook joined by Simon Hanson on drums and Stephen Large on keyboards (both from Glenn’s Fluffers and the previous Squeeze incarnation), Steve Smith of Dirty Vegas on percussion and Yolanda Charles on bass. It looks like they have two drummers on stage and when Stephen gets the Indian harmonium out the whole band is like a cross between the Difford and Tilbrook touring band of 1984 and Glenn Tilbrook’s infamous Gastric Band Tour with beard and tall hat (my favourite tour he has ever done). They start with Take Me I’m Yours, Slap and Tickle and Hourglass, all of which are click-track-tastic. Stephen Large is spectacular on the keyboards including that mini-moog which annoys Chris Difford so much. So far they’re a competent touring band rolling out the hits in 70s and 80s style to people in their 50s and 60s. Then they start the opening bars to the new single Innocence in Paradise and I have what I’ve been hoping for – a transcendent moment as I forget everything apart from the music. It’s a magnificent song and when the octave-apart vocal kicks in I have the pins and needles in the back of the neck feeling I live for. Yes! This is amazing! Cradle to the Grave and Nirvana sound great because Yolanda isn’t just a technically brilliant bassist but knows when to leave lots of space in the song. The fact that she sings well is a great bonus. What a fabulous addition! Rock solid and then fluid bass. She sings, she dances, she smiles. The Squeeze crowd will adore her. Steve’s percussion gives a much fuller sound and he’s quite animated on stage which helps the band seem less static. Chris Difford is sitting on a stool! There’s the usual frustratingly minimal chatter between songs and what there is becomes inaudible as the next song starts. The crowd are loving it. Exmouth is going wild for the new material. The Knowledge is the album on which Squeeze finally get political and Glenn Tilbrook’s lyrics (yes, I haven’t typed that wrongly) rail against underfunding of the NHS (I’ve worked in the NHS all my life so I’m with him all the way) and the wrongs of austerity; yet they manage to play it with a smile and a chirpy tune. I’ve heard Up the Junction so many times that it’s refreshing to hear it played slowly, delicately, with respect and with pathos dripping from every line. More pins and needles. It’s the outstanding moment of the night followed closely by another as Open, my favourite from the last album, Cradle to the Grave fills the room with love. It’s a seated venue and everyone’s firmly in their seats until Chris starts to shimmy and then the whole crowd is on its feet. I couldn’t have imagined it would happen. Eight songs later and the crowd are still up dancing! Yes, this is more like it. Then, just to make my evening complete, the band play Wicked and Cruel. It’s worth coming for just that. At the start of a Squeeze tour I’m usually super-critical and want to tell them, “Don’t play that song it sounds awful’, or ‘The keyboard sounds dreadful on that one’ or ‘Maybe you could try remembering the lyrics to the second verse.’ This time, there’s none of that. I’m looking forward to hearing which shows sound better as the tour progresses. A band always starts off a bit ragged and under-rehearsed, gets tighter and tighter and then very tight – too tight – in their playing and then start to ease into it, relax and groove a bit more until they’re at their wonderfully loose peak. Then they get demob happy and it all goes to pot in the final show. If it gets better than tonight you’re in for a great show. As I walked out of the venue I could see the space where Chris Difford’s car used to be, I waved to the crew backstage and set off home very, very happy and still a little tingly. Glenn’s RV was parked there still – the best place ever…..Chris realised that the fans wanted to show their appreciation and dance – so encouraged us to stand up by well honoured sign of palms up rising! This was a sign for us all to show our enthusiasm and let loose! Not easy in a venue with seated only – each seat connected to each with the minimum space of a cheap airline. However, we all managed and with a few grunts from neighbours when they moved right and I left (just hope my neighbour doesn’t subscribe to any no claims websites) we expressed our enjoyment of a wonderful gig mixing old classics with new. 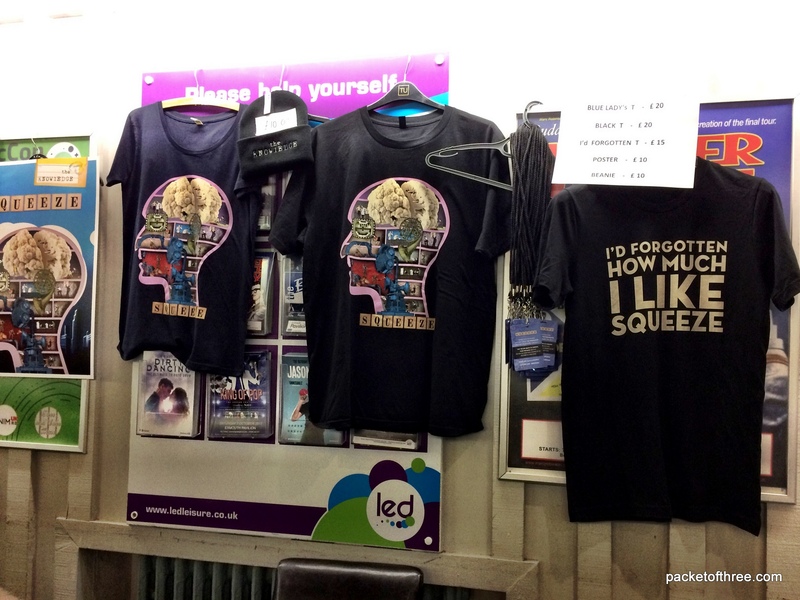 I can’t wait for the new album and the next chapter in the Squeeze journey! What a brilliant review David. Looking forward to the tour even more now, if that’s possible. That’s great Billy – all those new songs are a lot to take in so it’ll be even better when people have heard the album. Enjoy! Wow what a review…..I can’t wait for their concert at The Sage in Gateshead, by November they will have relaxed into the tour. I hope you have a great time there Liz! What is it about the Moog Chris hates so much?! It’s probably Glenn’s relentless need to experiment rather than the instrument! Thanks for the fantastic review. One question. No Muscles? Yes – tough one for them all together however – think Glenn’s RV was parked in ‘Some fantastic place’ – he was against the low wall to beach with view of sea and Devonshire countryside across the mouth of the river exe. We all know the heartfelt love in this song and I understand and respect them not singing it.